The students of all programs are hereby requested to clear total dues for Fall-17 by 24 December 2017. No one can participate the examination unless paying their dues. Canadian University of Bangladesh will remain closed on Saturday, 16th December 2017, on the occasion of the “Victory Day”. Canadian University of Bangladesh will remain closed on Saturday, 2nd December 2017, on the occasion of the “Eid e- Milad -un Nabi”. Classes will be held on Friday, 1st December 2017 as per Friday schedule. This is for information of and necessary action by all concerned. Pls. forget previous Mid term exam routine of Fall 17 and consider present attached file as Mid term exam routine of Fall 17. All classes of undergraduate programs scheduled on Sunday, 29 October have been cancelled Due to Fresher Orientation program. The date of make-up classes will be announced later. The students of all programs are hereby requested to clear total dues for Fall 2017 by 12 November 2017. No one can sit for midterm exam unless paying the said amount. It is also to be noted that Mid-term Examination of Fall semester 2017 will be held from 19th November to 26th November, 2017. 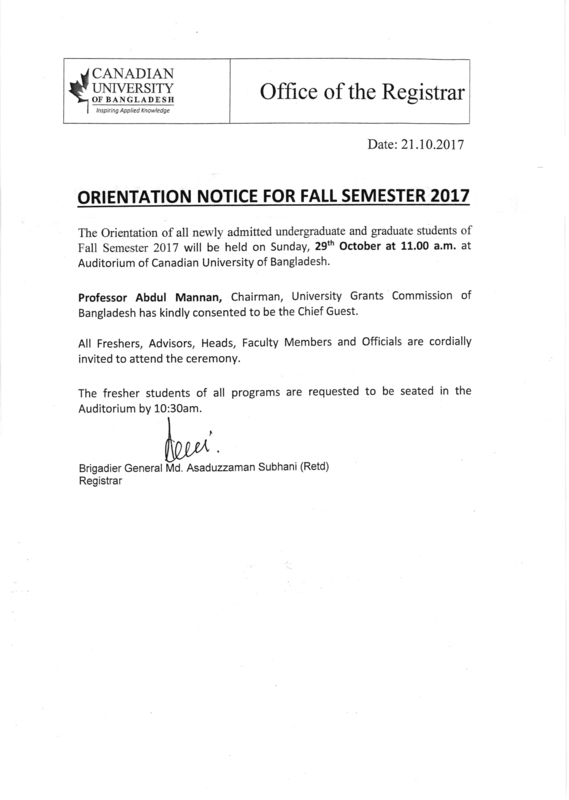 The Orientation of all newly admitted undergraduate and graduate students of Fall Semester 2017 will be held on Sunday, 29th October at 11.00 a.m. at Auditorium of Canadian University of Bangladesh. Professor Abdul Mannan, Chairman, University Grants Commission of Bangladesh has kindly consented to be the Chief Guest. All Freshers, Advisors, Heads, Faculty Members and Officials are cordially invited to attend the ceremony. The fresher students of all programs are requested to be seated in the Auditorium by 10:30am. The students of all undergraduate programs who have not completed their course registration for Fall 2017, are advised to contact their respective course advisor by 17 October, 2017. A fine will be imposed if a student fails to do advising within due date.